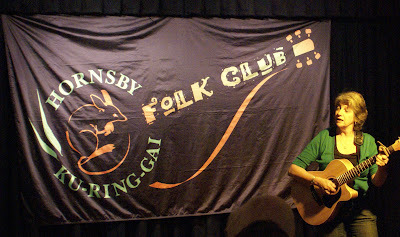 Hornsby Ku-ring-gai Folk Club aims to foster folk music and provides a venue for locals to perform to a sympathetic audience. Everybody is welcome. The club meets on the third Friday of each month at Beatrice Taylor Hall, Willow Park, Edgeworth David Avenue, Hornsby. Doors open at 7.30pm. Music starts at 8.00pm and concludes at 11.00pm. The club recently celebrated its 30th birthday and prides itself on its friendly and supportive atmosphere. The venue is a candle-lit coffee shop style setting, and you may feel free to bring a bottle and some nibbles. Each month a booked performer/s is featured, and floor spots are also available. The evenings are fun, friendly and full of variety. All forms of folk music, songs, poetry, etc are encouraged and the audience loves to join in the singing. Entry fee varies but as a guide $20 with concessions for Folk Federation members; pensioners may apply. Money raised less expenses goes to the feature artist. There is a tea break for a chat and a chance to meet the artists. Tea, coffee and cakes are provided; feel free to bring along something to share. Tables may be booked in advance, otherwise on a first come basis. Please note that reservations cannot be held after 7.45pm. Parking is available in the Willow Park car park and surrounding streets. Guest artists, floor spots, bush yarns, poetry. Candle lit venue, tea & coffee provided.